HIMSS is asking both major political parties to agree on on the idea that health information technology is is a useful tool in the transformation of the nations healthcare delivery system. In an era when getting our these political parties to agree on whether the sun rises in the east and sets in the west seems nearly impossible getting them to agree on the value of HIT may be optimistic, but I hope they’re successful. Concurrently, HIMSS continues to work with Congress to expand bipartisan leadership and support for system-wide adoption of private and secure health IT systems, which will pave the way to healthcare transformation through enhanced quality of patient care across the nation. eClinicalWorks®, today announced that New York City Department of Health & Mental Hygiene, an eClinicalWorks customer, received a 2011 HIMSS Public Health Davies Award of Excellence for its Primary Care Information Project (PCIP). The award, which honors excellence in implementing electronic health records (EHRs), was presented last week at the 2011 Public Health Informatics Conference. U.S. News Media Group today announced a list of the Most Connected Hospitals. The new list identifies U.S. News-ranked hospitals that are significantly advanced in the adoption of electronic medical record systems. We live in a digital age. We use electronic systems to connect with others, to entertain ourselves, and to compare the quality of myriad goods and services, including hospital care. Yet inside the walls of many hospitals, doctors and nurses still rely on reams of paper charts and antiquated systems to track patient health, order tests and treatments, and perform other essential duties. While many of these professionals provide quality medical care, they do so without the use of a suite of technologies broadly known as electronic medical records, or EMR’s, that could make patients safer and their care more efficient. By contrast, a relatively small number of hospitals have readily embraced EMR’s and use them to connect healthcare providers to one another and to the information each needs to do his or her job. An even smaller subset of those hospitals also succeed in delivering the superior care that U.S. News recognizes in its Best Hospitals. U.S. News developed Most Connected Hospitals to highlight that group of institutions, which are both digitally forward and clinically excellent. We began with a list of all institutions we either have ranked among the best in the nation or have identified as high-performing in at least one medical specialty in the 2011-12 Best Hospitals and Best Children’s Hospitals. HIMSS has launched it’s very own blog , cleverly called the HIMSS Blog. They expect to post daily on issues and initiatives related to their efforts to improve patient care with health IT. The first post is Certified EHRs…from Complete to Commodity. I’ve added them to my Google Reader and look forward to reading their daily thoughts. Hospitals and community health organizations continue to recognize the benefits of technology by implementing health IT to improve patient care, safety, and efficiency, including three finalists for the 2010 HIMSS Davies Organizational and HIMSS Davies Community Health Organization Awards of Excellence. The HIMSS Davies Community Health Organization finalist receiving a site visit is Open Door Family Medical Center, Inc. in Ossining, NY. Open Door’s patient base of almost 35,000 consists primarily of the working poor: low-income working families and vulnerable populations such as Latino immigrants, women and children who are never turned away from care. Two HIMSS Davies Organizational Award finalists will receive site visits. Sentara Healthcare in Norfolk, Va. has six hospitals, more than 100 physician practices and more than 340 physicians live on its eCare electronic health record system. As one of the nation’s largest health systems devoted to pediatric patient care, teaching and research, Nemours provides clinical care in four states – Delaware, Florida, New Jersey and Pennsylvania. It includes the 200-bed Alfred I. duPont Hospital for Children, which is set on a 300-acre campus near Wilmington, Del. For each award category, a review committee of former Award winners and other subject matter experts evaluates all application submissions. The committee members then vote to determine finalists for a site visit with the staff of the finalists to tour the facility and see the electronic health record workflow in action by various providers as described in their written application. Now in its 16th year, the HIMSS Davies Awards of Excellence recognizes healthcare organizations across the country that go beyond the standard of care with health IT, explained David Collins, HIMSS Director, Healthcare Information Systems. In all HIMSS Davies Award categories, the application serves as a tool for an applicant to assess and document EHR progress based on four key areas: management, functionality, technology and value, with greatest weight given to value achieved. Winners will be invited to present at the 2011 Annual HIMSS Conference & Exhibition in Orlando, Fla. and to serve on their respective HIMSS Davies Award Committee. For more information on the Davies Awards visit http://www.himss.org/davies/index.asp. The HIMSS Nicholas E. Davies Award of Excellence recognizes excellence in the implementation and use of health information technology, specifically electronic health records (EHRs), for healthcare organizations, private practices, public health systems, and community health organizations. Created by CPRI-HOST in 1994, the first three recipients of the Davies Organizational Award were recognized in 1995. In 2002, CPRI-HOST merged with the Healthcare Information and Management Systems Society (HIMSS), and now, HIMSS manages the award program. The Award honors Dr. Nicholas E. Davies, an Atlanta-based practicing physician, president-elect of the American College of Physicians, and a member of the Institute of Medicine Committee on Improving the Patient Record, who died in 1991 in a plane crash. For more information visit www.himss.org/davies. The HIMSS Electronic Health Record Association (EHR Association) today announced its new chair and vice chair, along with Executive Committee election results based on voting by the full membership during May and June. The Association is comprised of 44 companies that supply the vast majority of EHRs in use in hospitals and physicians practices in the US. Carl Dvorak, Executive Vice President of Epic Systems, has been elected to the position of Chairman, and Charles (Charlie) Jarvis, Vice President of Healthcare Services and Government Relations for NextGen Healthcare Information Systems, has been elected to the Vice Chair position. Mr. Dvorak was a founding member of the Association, now in its fifth year. He also served on the Executive Committee from 2004 to 2006, and was re-elected in 2009. Mr. Jarvis was first elected to the Executive Committee in 2007 and has also served as Chair of the Communications Workgroup, the Government Initiatives Workgroup and the Ambulatory Special Interest Group. Both will begin their one-year terms on July 1 this year. With hospitals expected to meet in 2011 the first phase of deadlines for Meaningful Use specified in the American Recovery and Reinvestment Act of 2009, HIMSS Analytics has added new questions to its annual Survey on Meaningful Use. The questions include those developed by the Health Story Project on the inclusion of structured document standards that must be in place so that narrative data converts to a structured format and can be imported in to the EMR. HIMSS Analytics Study: A leader in health IT market research, HIMSS Analytics tracks the EMR implementation status of more than 5,000 U.S., non-governmental hospitals through its annual Study with hospital CIOs. The data gathered provides a detailed look at the clinical and financial application environments in U. S. hospitals. HIMSS Analytics also developed the Electronic Medical Record Adoption ModelSM – or EMRAM – to score hospitals in the HIMSS Analytics Database on their progress in completing the eight stages to creating a paperless patient record environment. Kaiser Permanente, the nation’s leading health care provider and not-for-profit health plan, received 12 Stage 7 Awards from the Healthcare Information and Management Systems Society. The Stage 7 Award honors hospitals that have achieved the highest level electronic health record implementation. 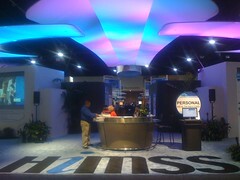 The 12 awards were presented at the HIMSS 2010 annual conference in Atlanta, Georgia. At the 2010 Healthcare Information and Management Systems Society (HIMSS) annual conference in Atlanta, Royal Philips Electronics will showcase how healthcare informatics solutions can help improve the quality and efficiency of patient care. This strategic focus underscores a commitment to providing advanced clinical informatics and patient monitoring solutions that complement electronic health records (EHRs) by providing actionable patient data to support clinical decision making.